Hawaii International Film Festival and 'Olelo Community Media have activated the lives of 10 local seniors, or kupuna, with digital filmmaking skills and an outlet to share their life stories and views. While at the Mapunapuna site of the 'Olelo community television facility, the video editing room was buzzing. The kupuna were on deadline. Their short film projects were being prepared for HIFF's fall lineup, as part of the first-ever Kupuna Lens program. These inaugural participants range in age from 60 to 83, and their biggest challange was to acquire digital technology skills that young people breathe, but was new to most of them. These are not aspiring Steven Spielbergs. But their messages and stories are nonetheless powerful and compelling. "This is groundbreaking," says Anna Page, HIFF's director of program development. Page was in Los Angeles when she first came across a similar program for seniors. On Oahu, she worked with 'Olelo to pattern Kupuna Lens after it. "This program empowers seniors to tell their stories," Page says. "Seniors present powerful stories. They are touching and beautiful." As part of their training with documentary filmmaker and educator Lisette Marie Flanary, seniors learned about storytelling, as well as working with digital cameras, lighting, sound equipment and editing their shorts with Final Cut Pro. While their stories vary, their work shares one main similarity. "The crucial ingredient is the spirit of wanting to share," says Meredith Nichols, 'Olelo's director of community development. 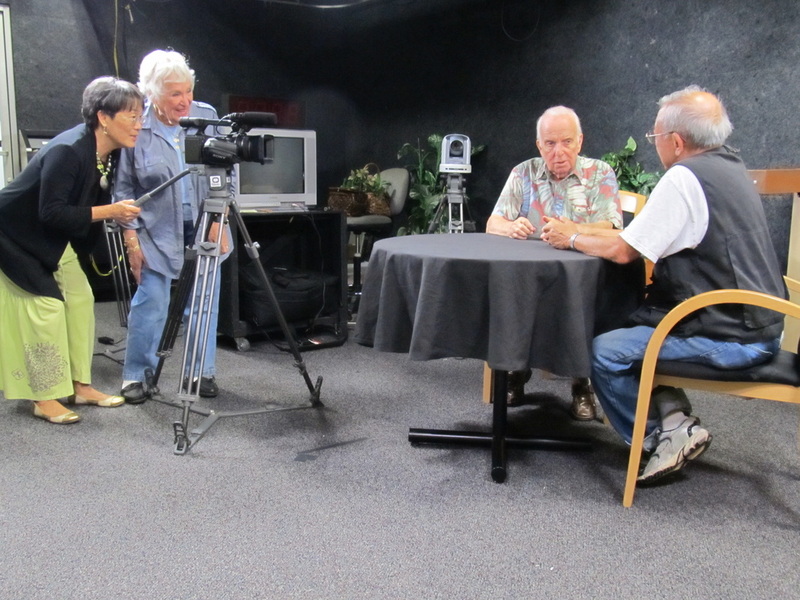 'Olelo has been involved in many youth-oriented video programs, but never targeting seniors. The goal is to expand Kupuna Lens to the 'Olelo sites beyond Mapunapuna, she says. But first, everyone must know how to communicate on screen. "It's like learning a new language," says Holly Henderson who created a short docudrama entitled, "Guests." Her film explores what would have happened if missionaries, who arrived in Hawaii in the 1800s had understood they were guests in somebody else's home. Would the history of modern Hawaii have turned out differently? "Every 10 years, I like to ask what else I can do," Henderson says. "This time around, it's filmmaking. The program exceeded my wildest expectations." She admits to being a technophobe over video technology and lauded dedicated instructors for support. Meanwhile, fellow participant Richard Soo produced a reality short of a Hawaiian family in Papakolea, a small community near Haleiwa. While the project is a tribute to the community's long history, it helped Soo discover his own Hawaiian heritage. As a former fire captain, Soo recalls taking phone calls from the media requesting information about various incidents. "Now I'm on the production side," he explains. "It closes the story for me." Another kupuna, Alice Unawai, has Maori culture running in her blood, and she hates being labeled a senior citizen. She believes those over 55 should do something with with their valuable experience and knowledge. Her work, "As the Years Go By," reflects her teaching career, during which she developed a widely accepted school program for students unable to see and hear. Her film, she says, is for seniors who have a dream and stay on course to overcome challenges. Growing old and the circumstances surrounding that process is the overriding theme of both Jade Young's "Healing from the Inside Out," and Lynne Halevi's "Care." Both works deal with members of the Baby Boomer generation who become caregivers for parents and family. While Young--a hospice chaplain and life coach--wanted to inspire those facing issues of death and dying, Halevi--a former actress--delved into the progression of her husband's battle with Alzheimer's. Despite the seriousness of some of the films, Phillip Kam went on a much more lighthearted approach. For his project, he simply brought a tofu desert to class, then he had someone else operate the camera while he stood and recorded his mother's recipe on video. "It's kind of fun thing," Kam says. "People watch the video and have the recipe." For his next project, Kam says he plans to produce and act. The premise? A one-hour show about kids playing hooky from school and going to the beach. "They'll meet me and I'll try to get them straight," he says.